Click the image above to view the band’s historic photos on our Flickr account. The City of Brisbane Pipe Band (COBPB) was formed in 1950, after a meeting at the YMCA in Edward St, Brisbane. COBPB wears McNeill of Barra tartan. The band initially wore Anderson tartan, chosen because it was distinctively different from other Brisbane bands’ tartan at the time. However, in 1986 the band adopted McNeill of Barra to honour the important role the McNeill family played in the life of the band, especially long-serving Pipe Major Ian McNeill. The band still has a family connection today – Ian’s daughter is still a current playing member. For the same reason, the band also currently uses the McNeill clan crest and motto, ‘Buaidh No Bas’ (Gaelic for ‘victory or death’ – not a motto we take too seriously, thankfully! ), in all formal marketing and communications. In 1976, Lord Mayor Clem Jones gave the band permission to display the Brisbane City crest on its drums – Alderman Sleeman formally presented the drums to then-Pipe Major Ian McNeill in a ceremony in front of City Hall. 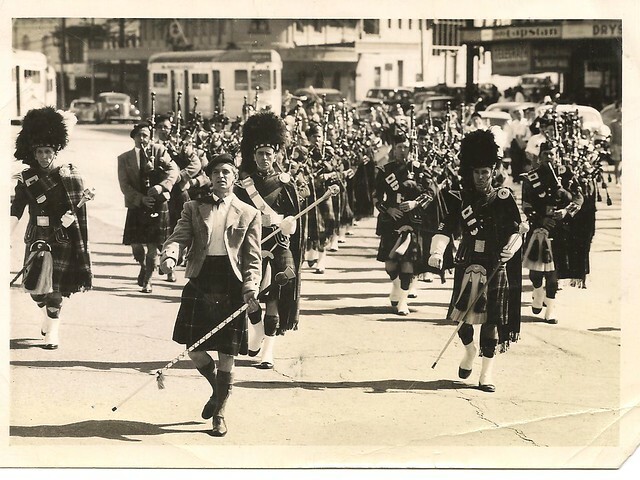 COBPB has competed in Australian and international pipe band competitions since 1958. The band is currently registered as a competitor band with Pipe Bands Australia – Queensland and competes annually in Grade 4 at most major local competitions, including the Maclean Highland Gathering, Brisbane Boys’ College competition, and Queensland Championships. The band competed in Grade 4 at the 2018 Australian Championships held at Brisbane Boys’ College. 1987: First place, Maclean Highland Gathering Grade 4 competition. 1990s: First place, Grade 3 Queensland Championship. COBPB has been a performance-focused band since its inauguration. We currently play for Brisbane’s major annual parades – St Patrick’s Day (March) and Anzac Day (April), and also lead the Brisbane Sikh community’s annual Nagar Kirtan parade. For a number of years the band also played for the Maritime Union of Australia’s Labour Day parades. Since the early 1990s, the band has played regularly for the Brisbane City Park Program to entertain the community and keep bagpiping traditions alive by playing Sunday afternoon performances in Brisbane parks. Since 2018, the band has played for the Paddyfest St Patrick’s Day festival, and we play regular gigs at local pubs and venues in Brisbane and surrounding suburbs. For many years, we have also been a regular participant at the Australian Celtic Festival in Glen Innes and the Stanthorpe Apple and Grape Festival. 1980s: support act for Rod Stewart concert. David Spotswood is now Drum Sergeant and has taught most of the current snare corps himself. Lord Mayor Graham Quirk (current band patron). Much of this information comes courtesy of the historic records maintained by Keith Beakey (COBPB piper 1969–1993), author of City of Brisbane Pipe Band: an Anecdotal History 1950–1993 [click the link to download the PDF – 5.5MB].